Racked pipet tips are packaged in environmentally sound 96 x 2 double rack to save plastic and are conveniently color coded in the classic yellow color for the 20 �30 �L, green for the 200 �300 �L and blue for the 1000 �1200 �L tips. Combination of gray color denotes aerosol filter tips. 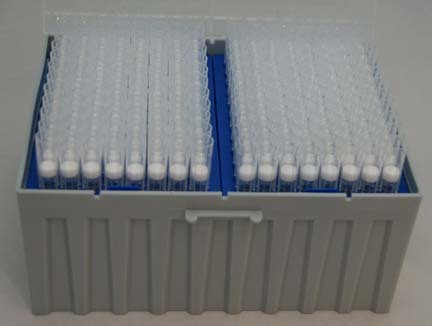 All pipet tips and tubes are pre-sterilized and are RNase, DNase and pyrogen free. Pipet tips are manufactured using virgin polypropylene and packaged under dust free conditions. Bulk tips are available for non-aerosol types and packaged 1000/bag. All tips are standard fit and fits most laboratory pipettes.